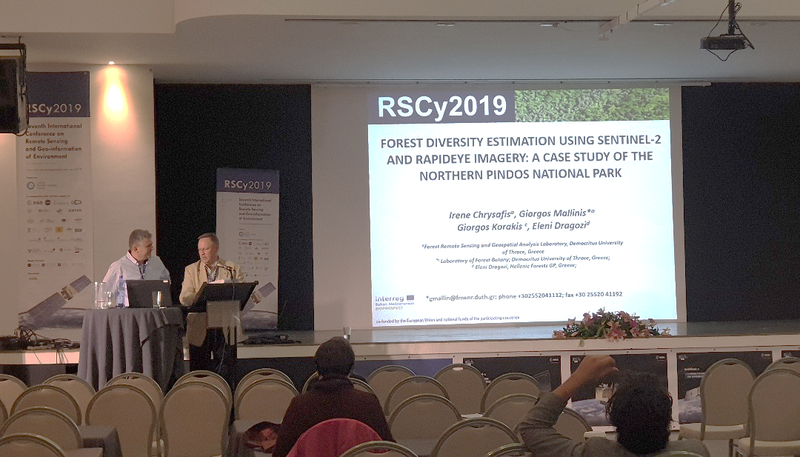 The BIOPROSPECT project was featured at the 7th International Conference on Remote Sensing and Geoinformation of Environmentʼ (RSCy2009) which took place in Pafos, Cyprus on March 18-21th 2019. The DUTH team (LP1), represented by the Associate Professor Georgios Mallinis, presented the first results related to the mapping and valuation of genetic pool and biodiversity services in forested protected area. DUTH’s team developed machine learning models to quantify and map the mean species diversity in the study area of Northern Pindos National Park, integrating field survey data with medium and high spatial resolution multispectral satellite imagery. This preliminary study which was presented at the RSCy2009 brought reliable results in estimation of diversity indices using spectral and spatial features of satellite and demonstrated the potential of the remote sensing technology for monitoring and reporting biodiversity over forest protected areas of BalkanMed region.